Windows Phone Event to unveil 9 new Handsets ? 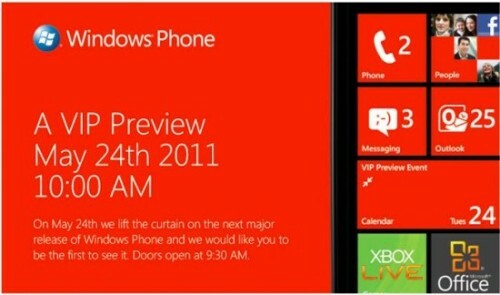 Microsoft is planning to unveil the next major release of Windows Phone at a VIP event on the 24th of May. Most likely the event will be seeing the highly anticipated ‘Mango’ update and there is news that new handsets accompanying the platform update will also be unveiled. According to WMPowerUser 9 new devices will be announced tomorrow. The new handsets are said to include 4 new handsets from Samsung, 2 from HTC, 2 from Acer and 1 from Dell. The announcement should include the rumoured HTC Bresson boasting the 16MP camera. Also there are words that Dell will be launching the Dell Wrigley which will be a full-QWERTY keyboard equipped handset.